These inspirational wisdom poems - like all wise poems for life - connects you to the natural intelligence within and all around you. While the mind can be smart; it is the heart that has wisdom down to an art. "I might repeat to myself slowly and soothingly a list of beautiful quotations from minds profound - if I can only remember any of the damn things." Humor, laughter, a genuine smile; so simple yet powerful - it can carry you for miles. The power of humor is that it takes you immediately out of the mind. Try explaining a joke; and suddenly what's funny is a bit hard to find. When a joke is analyzed - once it's handed over to the clutches of thought - the humor in it dies. What a thing to realize! The same is true for wisdom. Nothing quells wisdom faster than a quick, judgemental comment from the mind. Wisdom enters open spaces; not areas confined. Humor and laughter bypass the usual refrains of the mind. With this freshness we absorb information and integrate new experiences in kind. We change and marvel at how easily change has come our way. Transformation doesn’t always have to be hard, no matter what the mind may say! "Your body, and not just your head, is the field in which you experience everything that happens in your life." Experience is life - thank goodness for the body. With thinking alone - life may very well prove shoddy. To have experienced something is to have lived it anew; way beyond what the mind may think or construe. When it comes to experience thought can only take us so far. It can lead us to the door - it can even leave it ajar. Stepping out of the mind is flinging that door wide open; it is to step through for the truth - the spell of the mind to be broken. Truth is beyond thought. Truth is beyond belief. Who would have thought that truth can save us a ton of grief? Suppose our mind has come to regard us inadequate; suppose it believes us unsturdy. Suppose our mind has come to believe we’re not good enough and that we’ll never be worthy. These are beliefs, yes. But are they truth beyond doubt? The mind may hold them as such, yet the truth will come out. The warrior within doesn’t like to be limited nor confined; this is its power in bringing truth to the mind. The warrior within asks the mind to change and adapt - to let go of a belief in exchange for a fact. The mind very well may insist on its own. It may fight and resist before giving its throne. At the end of the day, when all is said and done; the mind is but small - it isn’t the one. Life is intelligent - it has a wisdom all its own. To access this wisdom, however, we need to kick the mind off its throne. Our ideas about life - how it should or shouldn’t be; that’s what we discard so that the eyes can really see. Opening up like this, inspiration fills our lives. We feel renewed, refreshed - restored. We experience the part in us that thrives. "In the end there are three things that matter in life: How well did you love? How fully did you live? And how deeply did you learn to let go?" Western culture asks of us to secure and possess. Is it any wonder that we tend to over-think and obsess? Western thought regards letting go as a loss; it never stops to consider at whatever the cost. The mind loves to obsess but of course! It loves to hold on to thoughts, even as they gallop like a wild horse. The mind holds on to emotions, ideas, opinions, beliefs, judgements and points of view; it will defend them to the end and will have you percolate and stew. It will hold on to people, relationships and things; even though they can’t be truly grasped - the mind attaches to imaginings. As an example, the mind holds to images of both self and another - often failing to update the changes in each other. Letting go isn't easy on the mind; no wonder the will to let go is sometimes hard to find. The warrior within can see the mind - naked- as it is. What the mind doesn’t know… is that the warrior within can let go. Letting go of all fear, the warrior within drawing near; we bravely let go and watch our wisdom grow. Your reading of wisdom poems is now complete! 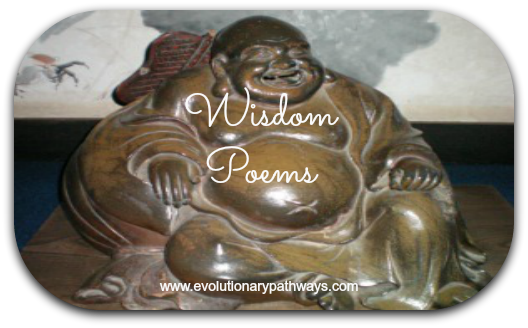 Loved these wisdom poems for stepping out of the mind? There are more wise poems here just waiting for you to find.